Edward Lukas in the Economist writes about the most contentious issues in Eastern Europe. The contemporaty city of Vilnius is certainly one of those issues. Very few people realise that as a result of the 1939 Stalin-Hitler agreement deviding Europe Lithuania got a seizable piece of land predominantly populated by Slavs – Belarusians and Poles. Fortunately, the dispute between Lithuanian, Polish and Belarusian historians over Vilnius is peaceful. In early 1990-s Belarus and Lithuania had virtually identical courts of arms. Belarusian President even shared a story of his Lithuanian counterpart poining it to him that Belarus was using "their" symbols. Lukashenka was happy to give up the more glorious version of the Belarusian history in exchange for oil and other benefits from Russia. Russian historiography had always supported the myth of ethnic Slavs being prosecuted in the Grand Duchy of Lithuania – one of the most influential states of mediaeval Europe. All the arguments below are a) historically plausible and b) strike most outsiders as quite mad. … Not many people realise this, but most of the people speaking Polish and Belarussian in the area in and around Vilnius are not really Slavs but polonised Lithuanians, the legacy of centuries of forced assimilation. That is a terrible fate, so the right (and kindest) thing to do is to depolonise these people and relithuanianise them. A good way to start is to make sure that they do not get trapped into using foreign Polish letters and silly spellings when writing their names. It is Adomas Mickevicius, not Adam Mickiewicz. Let nobody forget it. Read 'You say Lwów, I say Lviv' in the Economist. In his article for the Jamestown Foundation the known expert on Belarus David Marples portrays Andrei Sannikau who recently announced his willing to run for the presidency. Sannikau Throws His Hat in the Ring The Jamestown Foundation Publication: Eurasia Daily Monitor Volume: 7 Issue: 56 March 23, 2010 By: David Marples A key opposition leader in Belarus has declared his candidacy for the next presidential elections, scheduled for 2011. Andrei Sannikau, the leader of the civic movement European Belarus, held an interview with “bloggers” in mid-March to outline his policies and answer questions. His decision reflects long-term disillusionment with recent attempts by the United Democratic Forces (UDF) in particular to engage in dialogue with the Lukashenka regime and support Belarus’s membership of the Eastern Partnership Project. Ironically, Sannikau is also the most overtly pro-European of all the candidates to date, though he wishes to replace the Lukashenka regime with a completely new administration and state structure. Sannikau is the third opposition candidate to decide to run for the presidency, following earlier statements by Alyaksandr Milinkevich and Ales Mikhalevich. It is also anticipated that the UDF will choose its own candidate, which raises the question as to whether yet another candidate from the opposition will undermine the chances of the country gaining its second president since elections were first held almost 16 years ago. Sannikau was born in 1954 in Minsk and graduated from the prestigious Minsk State Pedagogical Institute of Foreign Languages (renamed as Minsk State Linguistic University) in 1977. He completed course work at the Diplomatic Academy of the Ministry of Foreign Affairs of the USSR in Moscow in 1989, and holds the diplomatic rank of ambassador. From 1991 he worked in the Belarusian foreign ministry, rising to the post of deputy foreign minister, before resigning in November 1996, in protest against the controversial referendum that drastically amended the 1994 constitution in favor of greater presidential authority. Since then, he has been the coordinator of the civic initiative Charter-97, and he now also leads the European Belarus civic campaign (Belorusskaya Delovaya Gazeta, March 15). When it was formed in January 2008, European Belarus announced at a news conference in Minsk a long-term campaign for the country to gain European Union membership, where its representatives were Sannikau, Viktar Ivashkevich, Mikola Statkevich, and Mikhail Marynich. 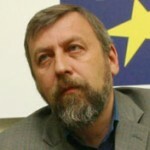 Sannikau stated that their goal was to recruit volunteers to gather “hundreds of thousands” of signatures for an appeal to the governing bodies of the EU, leading to the integration of Belarus into European structures (European Radio for Belarus, January 24, 2008). On March 15, Sannikau summarized his proposed presidential policies through a question and answer session with Belarusian bloggers. His campaign will rely on his family, those who share his views, former classmates, and Belarusians. He describes his political stance as “right-centrist,” and notes his experience as the head of the Belarusian delegation at the talks on conventional and nuclear disarmament that followed the collapse of the Soviet Union and the emergence of an independent Belarus. He is a firm believer in democracy as a system that offers the right of choice to all its citizens. He supports a relationship with Moscow based on mutual understanding rather than petty conflicts. Concerning the current regime, he would refer the fate of “Citizen Lukashenka” to an independent court and rely on lawsuits from individual citizens. He would change the current national symbols and reduce special detachments of the militia, though not necessarily the army, which has been downsized in recent years (www.charter97.org, March 15). If elected, Sannikau intends to enact sweeping reforms of the entire political and economic systems. Regarding the latter, he would provide opportunities for small and medium businesses. With respect to political reforms, he plans to construct “a normal state” by restoring the principle of the division of powers, recreating a parliament with real authority and securing the independence of the courts. His free society would also be dependent upon an independent media. Ultimately, he wishes to see Belarus develop a “European level of life” within the briefest possible timescale, rather than have it regarded as a pipedream for the distant future (www.charter97.org, March 15). His campaign raises some important questions: foremost is whether the EU would be prepared to abandon its current dialogue with Lukashenka and embrace an opposition candidate who is firmly opposed to cooperation with the regime. Indeed, Sannikau and his wife, the well-known journalist Iryna Khalip, have been especially targeted in recent days. On March 5, they were detained on the Lithuanian border for three hours by the Belarusian border guards and had a laptop confiscated (www.charter97.org, March 6).